It’s VERY important that your cat doesn’t accidentally get out of your home. As they’re so frightened of people, they can be very, very, very hard to find and bring back into care. If they end up at a pound or shelter, there is a very grave risk that they’ll be killed, even though they’re microchipped, as they’ll be difficult to scan. They will be labelled ‘feral’. Despite sometimes months of searching, and using the knowledge of missing cat experts, we have not always been able to find frightened cats who have got out of their foster carer’s home. Sadly, we don’t know if they’re dead or alive. It is much easier, and less time consuming, to keep your cat safe than to find them if they get out. If a cat can fit their head through a gap, they can fit their entire body through it. 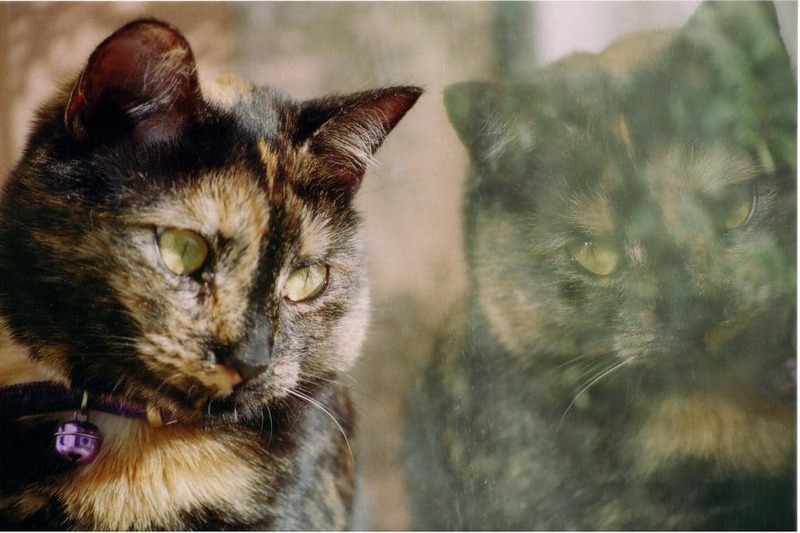 Here are some tips on preventing your cat from becoming lost. 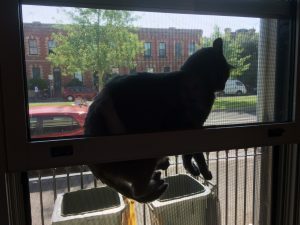 Even if your cat is in a crate, you still need to have windows only open a small amount – they can get their heads through crate wire if they’re determined enough. Watch some cats do this. To keep them safe, keep all windows that they could possibly access open no more than 2cm, even if the windows have flyscreens. on the corner of a wooden wind-out window to create enough of a gap to get out. If it’s not Crimsafe, it’s not catsafe! Bodhi wedged himself between the window and flyscreen. Thankfully, the flyscreen was Crimsafe and it didn’t pop out of the frame. Xavier pushed against the corner of this wooden window frame and got out, while his foster carer looked on, aghast. He hasn’t yet been found. Illegal fireworks frightened Akasha so much that she pushed against the corner of the flywire until it popped out of the flyscreen frame, then jumped from a first floor window. She hasn’t yet been found. Chloe got into the ceiling, while there were small gaps in it to install ceiling fans. Her foster carer has no idea how she got up there and only found her because she miaowed (she’s not a scaredycat). Hubby has now installed the ceiling fans. Wind-out windows: Check that the winder is taught and that the window can’t easily be pushed further open. Push against the corners of the windows to assess flex. Adjust winder if necessary. Sash windows (lift-up): Put a nail 1cm above the top of the frame that lifts up, so that they can’t push it further up. Sliding windows: Put a piece of wood in the track so that they can’t push the window open further. Never leave an external door open, even for a couple of seconds. Cats can bolt out very quickly. If you lose them, you will have to spend an incredible amount of time trying to find them. It’s just not worth it. If you have ducted heating, check how easily the vent covers can be removed. One scaredycat lifted off the cover and went into the ducting. Getting them back into the house took a bit of work. Make sure your cat can’t get out through the chimney. 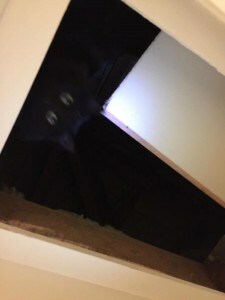 One scaredy cat got out through a chimney, twice. If your scaredy cat does get out of your house, or if you can’t find them in your house, implement your search plan immediately.